Here are some helpful tips to remember when measuring your supply only stairs. All measurements must be as accurate as possible, and measured in millimetres. If you are unsure of what options will work for you, a plan and side view of your structure with measurements and other relevant details such as architraves, doorways, and windows will help us to assist you in selecting a stair that will fit. Contact us at info@allwoodstairs.com.au. 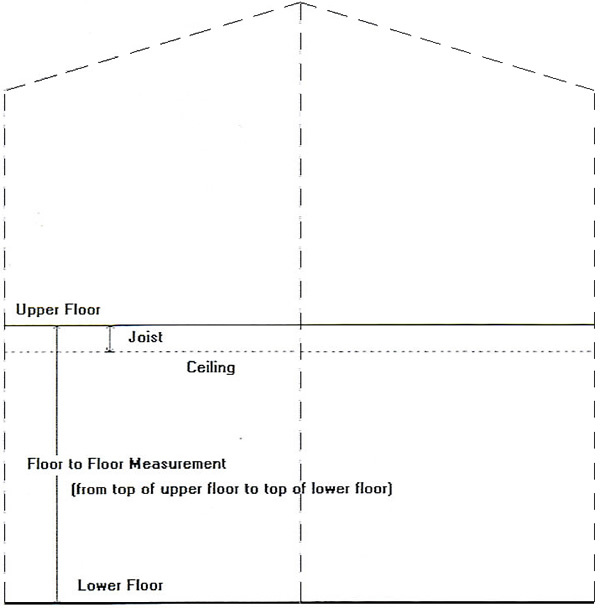 When measuring a floor to floor measurement always take the flooring that will be added to the top and bottom level into account. Example: If the bottom floor is to be tiled the thickness of the tile needs to be subtracted from the floor to floor. If the top level is to have timber boards the thickness of the timber needs to be added to the floor to floor. When allowing for the width and/or length of your staircase you must deduct any wall coverings that you have yet to go up from this measurement. Example: If you measure the width of the stair at 700mm and you are fixing 12mm Gyprock later this needs to be deducted to make a width of 688mm. Allwood stairs can help you with headroom issues and the dimensions of the stair well if required. A detailed drawing including all the relevant dimensions of the stair well if required. A detailed drawing including all the relevant dimensions including the bottom floor to the ceiling of the bottom floor is required. It should be noted that commercial buildings have strict guidelines to the dimensions and clearances of the stair - please contact us for more information. Installation of the stairs normally occurs once the floor coverings and the gyprock is in place.